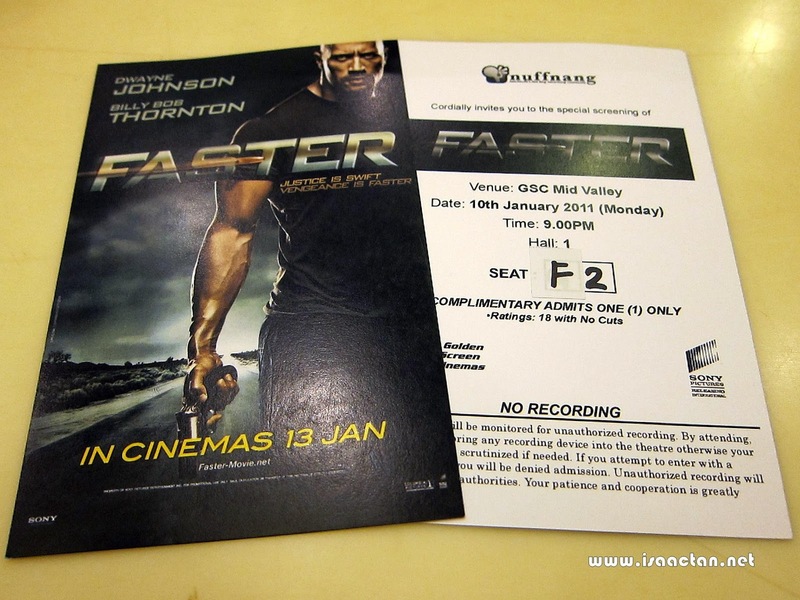 Last week, got myself 2 tickets for the movie premiere of Faster to be shown tonight at Midvalley Megamall. As usual I reached the cineplex early. We were suppose to collect our tickets at 8pm from the counter at the cinema lobby, but I was already there loitering around as early as 7.30pm. The queue was already quite long 10 minutes before the counter opened. At 7.55pm, the counter opened and we were promptly given our tickets. No freebies this round for me. There were allocation of freebies, but too limited and only around 10 plus nuffnangers got it, the front few. The freebies were t-shirts, and some keychains. The movie Faster started on schedule at 9pm. Let me give you a brief writeup on the movie itself. Well, it stars Dwayne Johnson aka The Rock, who plays the Driver. We have the Driver, the Killer, and the Cop, 3 of which are the main characters for the main parts of the movie. The Driver just came out from prison, doing time for 10 years for being involved in a bank robbery. His brother was killed after the robbery from a betrayal, and the Driver vows to have vengeance. Vengeance he did get, going on a rampage picking off one by one the people who were involved in the murder of his brother. The Killer's role was to kill off Dwayne, while the Cop's role as you would have guessed, is to nab the Driver. Overall the movie stays true to its title of being faster, fast in its pace. Pretty violent movie with lots of gunshots to the head. Overall a pretty decent movie with a slight twist in the end. Not a memorable movie though. Tell me if u get any new premiere screenings from nuffnang. Hehe.